A forum was held on Friday, October 21st, at the Murphy Institute for Worker Education and Labor Studies in New York City entitled Confronting the Tragedy: Law Enforcement Unionism & Communities. The purpose of the event was to begin a conversation about the social divisions between workers living in their communities and the workers among them who are employed to enforce the law. The talk was moderated by Ed Ott, Distinguished Lecturer in Labor Studies at the Murphy Institute and former director of the New York City Central Labor Council. 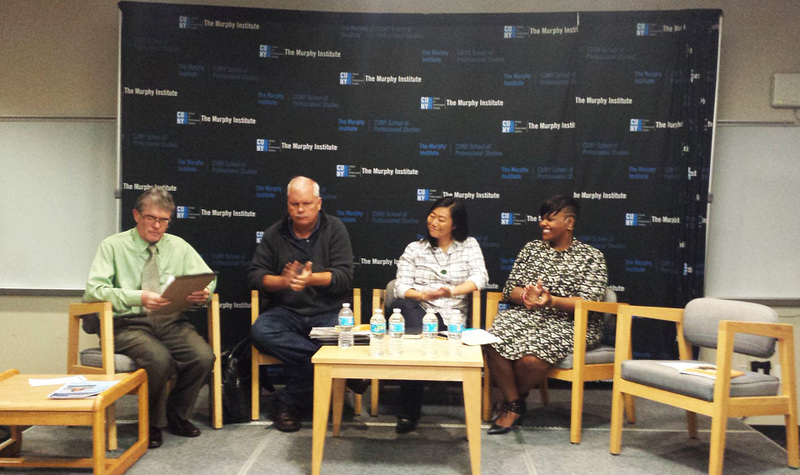 The panel included Carmen Berkley, an activist, writer, and trainer who currently serves as director with the Civil, Human, and Women’s Rights Department of the AFL-CIO in Washington; Joo-Hyun Kang, Executive Director of Communities United for Police Reform (CPR) in NYC; and Eugene O’Donnell, former NYPD officer, prosecutor with the District Attorney’s office in Brooklyn and Queens, a former police academy instructor, and professor at CUNY’s John Jay College of Criminal Justice. The panel discussed relationships between labor and community concerns and how the AFL-CIO is bringing together the concerns of many different kinds of workers, including police, to address issues of race and racism. Berkley insisted on the importance of including workers hired by law enforcement to be a part of the broader labor movement. After Mike Brown was killed in St. Louis, AFL-CIO President Richard Trumka noted that both Officer Darren Wilson, Brown’s killer, and Brown’s mother Lesley McSpadden were union members, saying that “our brother killed our sister’s son.” When Alton Sterling and Philando Castile were killed, Trumka released a letter to make the point that racism is a labor issue and that police violence is a union issue, since unions are the community. “People feel it on both sides,” said Berkley. “They are grateful that unions represent law enforcement workers and we represent someone like Lesley McSpadden, who is a United Food and Commercial Worker. Berkley emphasized how the struggle to find common interests between law enforcement workers and workers in other fields is uncovering how racialized police violence is rooted in the larger political and economic system. This was made poignantly clear when Eugene O’Donnell responded to the question of whether or not police are being asked to do too much. It should come as no surprise when the use of police where social services are needed brings disastrous consequences. Data collection on crime is skewed since it only reflects enforcement, not violation, of the law. “As we say at the AFL-CIO on our criminal justice team, ‘there’s just as much crack cocaine on Wall Street as there is on the street where I work,’” Berkley said. “Rich white people break the law, too, but because they have great attorneys and connections they’ve been able to maneuver through the system.” “In white communities, drug use is treated as a public health issue. Why can’t we treat it as a health issue across the board?” added Kang. Attendees at the talk asked O’Donnell why the police unions did not do more to fight racism internally and to remove violent or racist cops from the force, since police might receive more support from the community if their unions took on this role. Kang noted that unions such as 1199 and 32BJ have been hugely supportive in securing the necessary votes in the City Council to pass the Community Safety Act (CSA), two bills CPR had fought for to create a basic oversight framework for the NYPD. According to O’Donnell, being a cop is a job nobody wants, and retaining police is a challenge. Asked what police unions are doing to protect whistleblowers, O’Donnell replied that the department does not tolerate dissent. “It’s a quasi-military organization. If you fight the police department, you’re going to lose. They’ll take you out. They’ll take you later, but they’ll take you.” Retaliation against whistleblowers is a problem that Ott noted as being rampant in all public sector work, though perhaps even more so for police. O’Donnell also blamed the media for playing a provocative role and leaving out context. “Extremism is fueled when you leave facts out,” he said. The Murphy Institute will be hosting a similar conference on April 28th & 29th. Participating organizations and individuals are being encouraged to host their own discussions leading up to this event.